Needless to say, many mountain hikers and nature lovers will regard the area with disdain, and even by the late 1990s a botanical study concluded that ‘the changes in species composition clearly indicate that there have been immense environmental changes at Ulu Kali’ (‘A Reassessment of the Flora at Gunung Ulu Kali, Genting Highlands, Malaysia’ by Chua & Saw). However, civilizations come and go, and perhaps inevitably one day Ulu Kali will return once again to a more undisturbed state. For now, the area remains worth exploring for several reasons, not least because of the somewhat surreal aspect of the experience. Unless you have a car, the best idea is to take one of the regular buses from Pekililing Terminal in KL (there may also be a few direct services from KLIA). In good traffic conditions, you can be at the Awana Bus Terminal (1,050m) in less than an hour. This is basically the basement of a large mall complex. It is definitely a good idea to get here as early as possible (first bus in 2019 from Pekililing leaves at 7am) so that you can avoid the crowds of shoppers and enjoy the early morning views of mist swirling around. 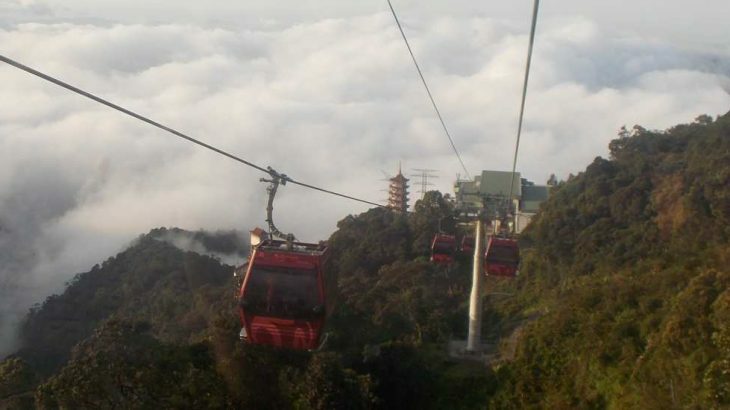 At the top of the mall is the Awana Skyway, a 2-mile long cable car / gondola lift which costs RM9 per person to use (in 2019) unless you want a glass bottom gondola which is a little more expensive. The journey to the top takes around 15 minutes and there is a mid-way station at Chin Swee Temple and caves (approximately 1,500m) which is worth stopping at on the way down. In clear weather the views are undeniably impressive. The summit station is called Skyavenue (1,710m) and is in the middle of another mall that is rather difficult to find your way out of! If you can find your way to Theme Park Hotel (Genting’s first hotel opened back in 1971 as Highlands Hotel) and then follow signs for Hotel First World then you are heading in the right direction for the highest part of the mountain at the peak of Gunung Ulu Kali. Considering that the summit is well under 1,800m and the mall is at over 1,700m, you might think that bagging Gunung Ulu Kali would be a very simple task. Unfortunately, the summit is covered with at least two or three telecommunications or military installation towers and the access road which begins near a little car-park (1,683m) has ‘access prohibited’ signs on it. The highest part of the ridge is approximately 2 kilometres away to the north-west. If you were with a local person with a car then it might be possible to venture further but (in 2019, at least) what could be a nice ridge-walk or nature trail is yet another one of Malaysia’s ‘no entry’ mountain peaks. The very few reports of locals having been closer to the summit than the hostile signs at the gate reveal that there are at least three pitcher plant species growing up here and that one ought to be wary of leeches in the forest here. Assuming the access road remains closed for the time being, for those who do not wish to trespass, the best thing to do is simply enjoy the views from this urbanized mountain before the hordes of shoppers arrive to do what they could more easily have done back down at sea level. Gamblers are attracted here as it is perhaps the only place in Malaysia to have legal gambling on offer. After what is undeniably a disappointing and possibly even disturbing experience seeing what devastation humankind has wrought on the natural environment, it is recommended that you call off at the Chin Swee Temple (1,425m) on the way down. The road back down is not pedestrian friendly, so it remains much easier to get the gondola back down and call off half-way to take some great photos of the temple with the skyscrapers of KL in the distance and a few minor jungle-clad peaks in the foreground. Getting there: About one hour by car or bus from Kuala Lumpur. Buses leave hourly from Pekiling Terminal in KL (RM10 in 2019). Accommodation: Plenty of hotels at the top. Permits: Access to the highest point of Ulu Kali appears restricted to those working on the summit communications towers. Water sources: Unknown but there is a mall at over 1,700m above sea level! Things didn’t get off to a great start after I landed at 0430am at KLIA2. I’d booked an Aerobus to Terminal Pekililing due to leave at 0515 so I could catch a second bus from there to Genting Highlands. It was still dark at the airport, very little information beside the bus bays. I asked some kind of assistant standing near the only Aerobus to KL I could find and he seemed puzzled by the destination. The Indian driver himself didn’t want to help, seemingly only interested in smoking as he sat on the step of the bus. The first chap ushered me on but 0515 came and went and I got somewhat restless and asked why we weren’t moving. Turns out the bus was due to leave at 0530 and for KL Sentral only. The Pekililing bus either never showed up, or showed up somewhere else entirely. The driver got very aggressive as he smoked another cigarette, smoke wafting into the bus and barked at me to get a taxi instead. Lovely customer service skills from this simply delightful human being. It was going to be quite tight getting to the terminal to make my connection if I didn’t come up with a plan B immediately and half of me wanted to just forget the trip and just go home instead of dealing with this crap that ought to be straightforward. Anyway, I decided to continue and got a meter taxi at the back. Came to RM110 including tol fee. Not cheap at all. At Pekililing, the unfriendliness of bus staff continued – no smiles as you would get in Indonesia, but more like barks, short orders, very unpleasant people. Thankfully things drastically improved as this first Gentings bus of the day sped up the hillside, rising above the clouds momentarily just as the sun began to rise. More than halfway up the mountainside, the Awana bus terminal itself is an eyesore, like pretty much all of the ‘development’ here. It was still early but there were already shoppers and tour groups milling around this shopping complex. I decided to take the cable car up to the top as soon as possible – no queue yet at 8am. I asked the ticket booth woman if I could take the cable car up and then walk back down and she laughed and said it was technically possible to walk back down but as I would see it is a long, long way. I bought a single ticket for RM9 (very reasonable) and kept my options open. Most cable cars were empty, and I would definitely say first thing in the morning is the time to enjoy this spot, despite the ‘development’. The views are fabulous in good weather. It was a mix of cloud and sun on this particular morning – very atmospheric. The middle station at the Chinese temple is especially photogenic and perhaps makes up for the hideous capitalist excess further up. At the top, you find yourself in yet another mall complex. I just wanted to get out and explore. The mall seems to be designed to keep you in, spending money at the many restaurants. The first guy I asked on how to get outside laughed humbly and said ‘I don’t know!’. The second guy got mildly aggressive and also claimed to have no idea how to actually get outside of the building. It was utterly bizarre, as if they are shipped in here to work and prevented from seeing what lies beyond the mall entrance, or even darker told not to give any information regarding outside to customers who they would prefer just stayed in the shopping zone to haemorrhage money. Finally, a third person, helped me and I set off down one arm of the mall, holding my GPS in one hand trying to find a signal for an elevation reading and a rough distance from the peak of Ulu Kali. I emerged at the back of a hotel and tried to find my bearings. Followed a one-way road up the hill a little. No views of higher ground – the top of the mountain was in cloud and very light drizzle. Highest reading on my GPS was around 1720m near a fire station. Beyond that, the road drops down and there is a carpark on the left. Here is the entrance to the Ulu Kali summit road (summit still 2km away) but the signs about it being a restricted area put me off, especially as I was alone and know that some of these places are manned, or even worse guarded by vicious dogs. Disappointing, but not entirely unexpected in this ‘developed’ part of Malaysian mountainside. Why is it that technically more accessible areas (Gunung Jerai, Gunung Brinchang, Western Hill, Serapi and so on) actually end up being the worst for proper access to the peaks? So, I went back to the mall area and set off walking back down the windy road. Not easy as a fair bit of traffic around and no pavement for the most part. A guy on a motorbike saw me, reversed and offered me a lift down. I said thanks but I would be happy to get off at the temple. He was a Chinese Malaysian who had lived in London for several years. A free ‘ojek’ in Malaysia always gives you faith in humankind. Lovely views at the temple, you could easily spend a couple of hours here especially if you like vegetarian food. I caught the cable car back down to the bottom station (9 ringgit too, although you can break your journey in either direction free of extra charge) and got a Grab car to Janda Baik (RM40) for some rest and preparation for Gunung Nuang the following morning.